For Joffrey Academy student Tim Macdonald, ballet is a lot more than “moving your body in weird ways at weird times.” We find out what else is involved. The Joffrey Academy of Dance is a ballerina’s gateway to the big leagues. The official school of the Joffrey Ballet transforms dancers as young as 5 into prima ballerinas destined to glide across the stage as Tchaikovsky’s famous swan. But the secrets of ballet aren’t limited to those who want to make dance their lives. The Joffrey Academy also holds classes for adults who simply want to point their toes and prance like no one’s watching. These beginner classes possess a certain kind of charm—where else are you likely to find serious dancers in tights and ballet shoes alongside newcomers trying to look graceful in socks and gym shorts? We spoke with a relative newcomer—software engineer, violinist, and Scottish country dancer Tim Macdonald—to see what it’s like to approach ballet as a beginner. He offered a few pointers for standing en pointe and otherwise navigating a world filled with nymphs and nutcrackers. 1. “Impressive” doesn’t have to mean “intimidating.” The Joffrey Academy is headquartered in a downtown Chicago studio that Tim describes as “gorgeous.” He admits there’s a mystique in simply entering and exiting the building, knowing how many famous ballerinas have done the same. The studio sits in a corner space with two walls of windows that look out on the skyscrapers of the East Loop. A baby grand piano in the corner plays romantic waltzes as students plié at the barres, occasionally stealing glances at the city below. For Tim, the grandeur of Joffrey can be a little intimidating. He often finds himself walking out of class and straight into an audition for a professional company. “Here I am, a casual ballet dancer…and there are just swarms of people dressed to the nines and super intense about this audition they’re [headed] to.” All the same, Tim wants to debunk a common myth associated with ballet: that “all ballet dancers are really intense and do it seven days a week for hours.” For many in the beginner-level classes, “it’s just a pleasant way to spend your morning.” 2. Clumsy? You’ll be in good company. It’s not that Tim hasn’t mastered his share of techniques. After only two sessions, he feels confident with all the basic positions as well as the tendu, a move that involves pointing your toes straight out in front of you. Still, the going has been rough in some spots. “[Pirouettes] were a disaster for me,” Tim admits. “We didn’t even do full pirouettes! We started with quarter turns and half turns…it’s a lot harder than you think it is.” For the uninitiated, a pirouette involves bending your knees and spinning as you rise back up, using your arms for balance and momentum. Tim recalls his several attempts with a laugh. “I stumbled. Noticeably.” Sometimes he’ll cheat by holding onto the barre, but he and the other dancers try to stay honest when possible. On the plus side, Tim says, clumsy dancers are always in good company. “Whenever there’s jumping involved, there’s that one person who jumps at the wrong time or trips dramatically and crashes into the barre.” Though people often land in less-than-graceful positions, no one ever laughs—“They’re very supportive over there,” Tim insists. 3. Your teacher might compare your abilities to those of a small child. Part of being supportive means adapting your lessons to your students’ abilities, and Tim claims that the teachers at Joffrey excel at this. It can be a humbling experience for dancers such as Tim, whose teacher prefaces basic techniques by saying, “This is how I tell my 6-year-olds to do it.” Some might be offended by the comparison, but remember—the 6-year-olds at Joffrey are vying to be the next Anna Pavlova. When Tim and his classmates are treated like grownups, the results can be terrifying. One day, Tim recalls, they all repeated the same move while the instructor “ran around to every single person…and smacked their knees in time with the music while screaming at them.” Perhaps not the most conventional tactic, it nonetheless ensured that everyone was on the same page. 4. Ballet could change the way you walk. Though he hasn’t been in the class long, Tim claims that ballet has already inspired a few changes in his everyday movements. “Sometimes I’ll catch myself closing in first position if I catch a red light walking to work,” he says. “Or when I’m jumping over the ridiculous pounds of slush in Chicago, I’ll jeté.” The classes have also helped Tim find new ways to express himself as an artist—no easy task, given the long list of artistic activities he’s already involved in. Still, when his feet match up to the tones and textures of the music, dancing becomes something profound—yes, even mystical. It’s not “just moving your body in weird ways at weird times,” Tim says. Though, to be fair, there is a lot of that. 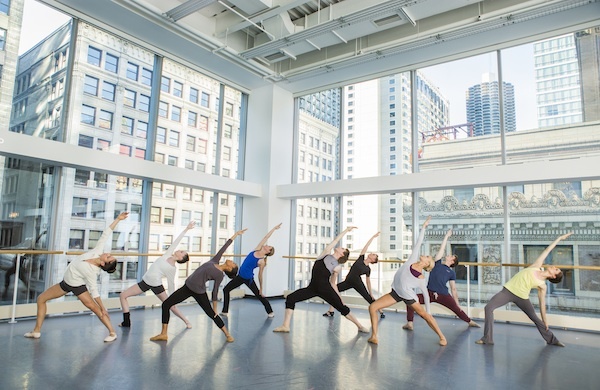 Learn more about the Joffrey Academy’s adult open sessions here. Drop-in sessions start at $10. Photo by Cheryl Mann. Stephanie McDaniel is a political theorist-turned-novelist from South Carolina. On the rare occasion she’s not writing, she spends her time folk dancing, singing, and adding sea salt to Lake Michigan.